Exploding grannies appear to be a thing these days. Especially at the beginning of books, and I suppose it’s as well to get granny out of the way as soon as you can, plotwise and with a violent end. 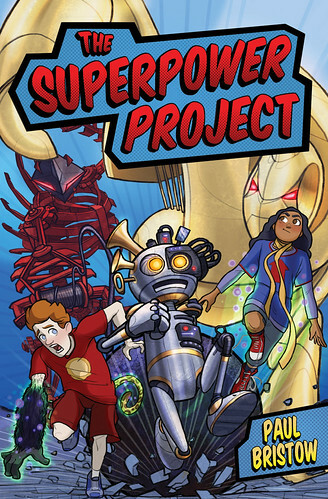 Paul Bristow’s first book The Superpower Project is both funny and exciting. Illustrated in comic style by Luke Newell, it looks just like the kind of book middle grade readers would be drawn to, but had I not been offered this by an adult, I’d never have looked at it twice. And that would have been a shame, because I enjoyed it a lot, and I should know by now not to judge a book this way. The blurb is much more my kind of thing, though. Megan and Cam suddenly discover they have superpowers. Megan can fly, and Cam can, well, turn into a hamster. This all seems to have something to do with Megan’s gran. They sort of inherit an ancient robot with amnesia, and soon after they discover that the town’s transformer-sculpture robots are out to kill them. So why did gran explode, what did she want them to do, and what’s with all these sculptures, and their weirder than weird owner Mr Finn? Set in Greenock, the children and their robot end up investigating old factories and an old hospital, a graveyard and the bottom of the river, among other things. They are brave and intelligent and with a nice line in humorous chat. And hamsters are obviously really useful animals. There is a promising epilogue, too, and I can only hope there might be more mayhem in Greenock before long. There are several other characters it’d be fun to see more of. And I actually didn’t know that all schools are legally obliged to have three nice teachers. This entry was posted in Authors, Books, Humour, Reading, Review and tagged Luke Newell, Paul Bristow. Bookmark the permalink.